As seen at The MAD Museum. All of these unique, laser-cut rolling ball kits are available from our gift shop at the museum, as well as our online shop at madfactory.co.uk. Links to instructions for building these kits are below. 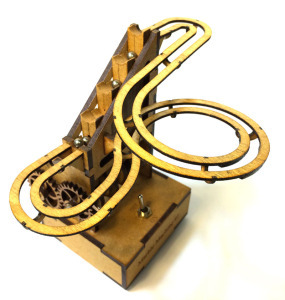 This hand-cranked machine is very easy to assemble and is suitable for use in school projects to teach about mechanisms. Also great for a rainy day project with the (grand)children. 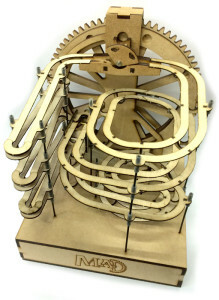 It is unique in the sense that it is built entirely from laser cut MDF. Slots and tabs are used in the design to ensure all parts are perfectly aligned. A minimum of sanding is required. 9.52mm balls are included. This machine is hand-cranked and has a stairs type lifting mechanism. The camshaft is geared down to ensure smooth motion. Made from precision laser cut MDF and plywood. Plated steel axles. 5mm steel balls are included with the kit. This motorised version of the #1 machine uses a small gear motor to power the stairs type lifting mechanism. Made from precision laser cut MDF and plywood. Plated steel axles. 5mm steel balls are included with the kit. Soldering is required to complete the kit. 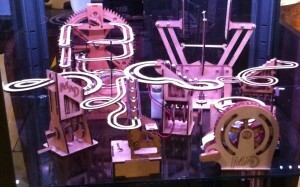 Marble Machine #2 is motorized and features dual tracks with a track switch and a ball accumulator. The lifting mechanism is the wheel type. Everything you need to assemble the kit is included except for glue and batteries (2xAA). Made from precision laser cut MDF and plywood. Carbon fibre uprights with silicone spacers. 7mm steel balls are included with the kit. The lifter wheel is pre-assembled and has the pockets for the balls drilled to the right depth and angle. Motor, switch and battery box are pre-soldered. 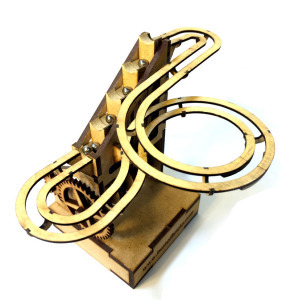 The perfect starter kit for budding Automata makers! 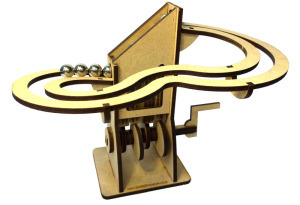 This simple kit is ideal for kids* and offers a great demonstration of a working crank mechanism. Pick from one of five great shapes to put on the top of your finished Automata. Turn the crank handle and see your shape come to life! The kit is precision cut from 3mm plywood. Easy to assemble. PVA or similar glue required (not included). 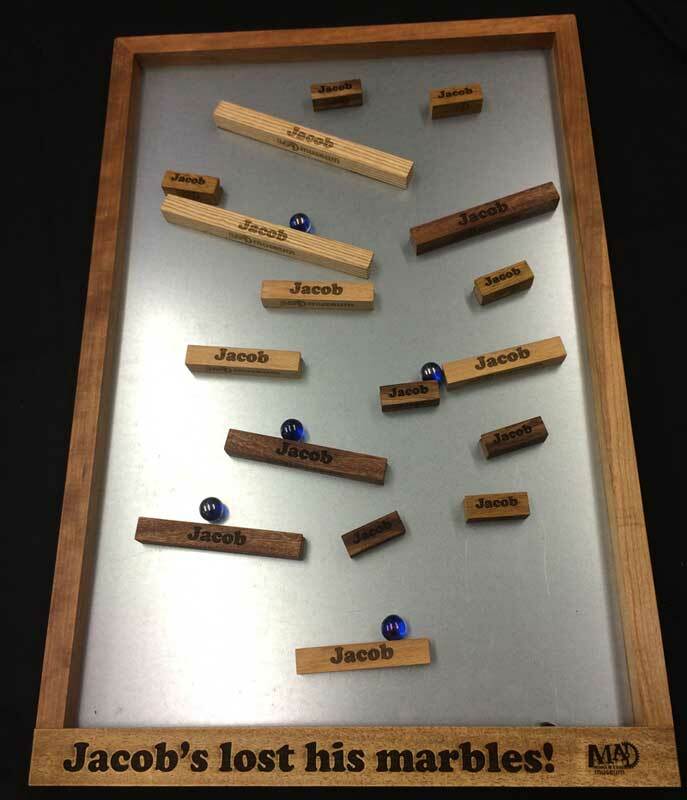 We now offer “MAD Marbles”- Design your own personalised marble wall and track pieces only at The MAD Museum.